It is a proven fact that children, especially toddlers, learn best when they are playing and interacting with their environment. This is one of the main reasons that toys feature different textures, flashing lights of different colors, and strange noises that will keep them entertained for hours. The thing is these toys help them develop mentally and some help their coordination, but almost all toys for toddler aged kids do not help them learn balance. The ones that do, may pose a hazard to the same kids that it can help, especially if they are not ready. For example, a tricycle or a small bicycle with training wheels. It takes a lot of effort for kids to remember pedaling, steering in the right direction, and balance. That is why many parents are thrilled over the invention of toddler friendly balance bikes for toddlers who may not be ready for the pedals and the speed that comes from a regular bicycle. This type of bike works without pedals so that your toddler aged child can start learning the joys of this ancient form of travel without worry. They have wider tires than traditional bicycles and they set their own speed so that they go slow or slightly faster as their skills improve. By avoiding the pedals, your child will be able to focus only on steering and learning how to balance. Most of these bikes are made out of either wood or metal and they are all easy for a child to learn how to ride. They also make it easier for a child when it comes time for them to transition into a normal bicycle and some kids can do it without training wheels as soon as they figure out how to pedal and control their speed. Self-balancing bicycles for toddlers do not require a battery. They work off your child’s ability to push themselves forward. Some parents question where the child’s feet will go when the bike is in motion. The answer to this is simple; a child will lift their feet when the bike is moving forward and put their feet down instinctively if they feel themselves falling to one side or the other. In short, they work the same as other ride on toys for small children, but they have a seat and two wheels, much more similar to a bicycle..
What Are the Benefits of a Balance Bike? If you are still not convinced why you should consider getting a balance bike, perhaps you will enjoy knowing why other parents feel it is a great idea. Here are just a few of the benefits of ditching training wheels and choosing a balance bike. A balance bike is easy enough for children as young as 18 months to ride. By starting young, you can teach them about safety while they are riding the bike. You can encourage them to use hand signals and how to steer the bike in that direction. You can talk to them about using caution and other traffic rules. They will learn to brake and balance well enough that when they are older and ready for an upgrade to a new bicycle, they will most likely be able to skip the training wheels and simply take it for a spin. This is because they will already have confidence in their own ability to stay upright. They will have already worked through the fear of falling that most older children may have when getting on a bicycle the first time. It will still take effort for them to learn how to pedal, but for most kids, this is also a relatively natural process once they have their balance figured out. One great thing about balance bikes is that they are very lightweight and much less likely to tip over than a tricycle, which is unstable at best, or a bicycle, even one with training wheels. If your toddler falls to the side and a standard bicycle falls on them, they will possibly be hurt by the weight of it landing on them. These bikes are up to three times lighter than traditional pedal bikes. When a child falls over, you will know that they are not injured and you can get them to try again with very little encouragement. The pedals are not there to block them from getting their feet on solid ground and this will help them learn to catch themselves before they fall. These things are great for young children who are biking for their first time.​The fact that it is lightweight and pedal-free will also make it easier for them to travel distances without getting tired from it. This means you can take them to your favorite hiking spot and show them how much nicer it is if they can ride the trails rather than walk. It is also easier on their small bodies and muscles than traveling with a tricycle or training wheels. You can prove that they will be able to cover more distance and see more things along the way; all while they feel the wind on their faces and enjoy time outdoors. By starting young children early how to ride a bicycle safely, you will encounter less obstacles when getting them on a two-wheeled bicycle. You can encourage your child from day one to wear a helmet when riding, as well as knee and elbow pads or other things that you feel should be worn. You can talk to them about wearing bright colors or something that is reflective when they are going to be riding their bicycle and encouraging them to wear their shoes on it as well. One key thing to remember is that even balance bicycles should not be used with flip flops or sandals that may come off easily because your child will be using their feet to power the bike. The earlier you start teaching bike safety, the more comfortable your child will be wearing a helmet and other stuff. ​Tricycles are unstable and hard to use. Their pedals are on the front wheel and all the weight is on the back. They are prone to hitting roots or dips and jerking the wheel around and have also been known to flip backward on kids in the past. This is more than enough to scare some kids away from trying after a time or two. They also do not have training wheels, which may cause them to lean to one side and it could trick your child into thinking they are balanced. Then when they get rid of the wheels, they find out that they fall more often because they lean to that direction. This makes it more confusing to them and frustrating as well because they must relearn how to ride without the lean they can enjoy riding on two wheels. Many toddlers have older siblings that may already be able to ride a traditional bicycle. This will make it difficult for the toddler and child to play together outside if the older one wants to ride their bike. By having them both on bikes that they can enjoy, you are allowing them to play together or take trips down the driveway together. If there are no older children, your child can bond with you while they learn hand signals and they can see that you are proud of their achievement in riding a bicycle. They will also enjoy biking alongside of you rather than be left at home or carried behind you. There are many balance bikes available and most people have favorite. We are no different. We have searched the internet to find bikes that we, and the other parents who have given them a try, feel are the best, most safe, option for small children who want to ride like a big kid. This bicycle is designed for children that are between 18 months and 3 years or less than 60 pounds. 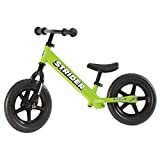 It looks like a real bike and has several colors for you to choose from including, Strider Green, Strider Blue, Strider Pink, and Strider Red. It is a bike that proves if you are big enough to walk, you can ride a bicycle. It has a high-performance design that will be fully assembled in less than 5-minutes. For confident, older toddlers, there is a foot rest built into the rear wheel frame. The seat and handlebars are fully adjustable to meet your child’s height requirements. 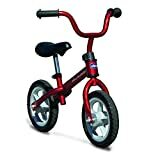 It currently holds a 4.7-star rating by parents who trust Strider balance bikes for their children. It comes with a two-year factory warranty. It weighs in at 6.6 pounds and measures 15 x 33 x 22 inches. ​Schwinn has always been a popular brand of bicycle and this balance bike is no different. Parents and toddlers give it an average rating of 4.3-stars for quality and usability. This 12-inch balance bike has an adjustable seat and adjustable handlebars. It is designed to make your small child feel like they can ride along with the big kids. Schwinn offers four color choices including, pink, blue, red, and green. It is a little heavy at 13.6 pounds and according to some parents, it is best used by kids that are taller than 37-inches. The Schwinn Balance Bike is designed with a BMX look and a steel frame-its pedal-free, low center of gravity makes it easy to ride and perfect for young riders. ​If you have a child who is nearly ready for a traditional bike, but you want to ensure they know how to balance well on one; the Chicco Red Bullet could be ideal. It is designed for kids over 3-years and looks like a standard bike, apart from the fact it has no pedals. Your child can ride on it safely until they reach 55 pounds and it is ultra-lightweight at only 6 pounds. It has an adjustable seat and handlebars to ensure your child can use it until they are ready for a standard bicycle. 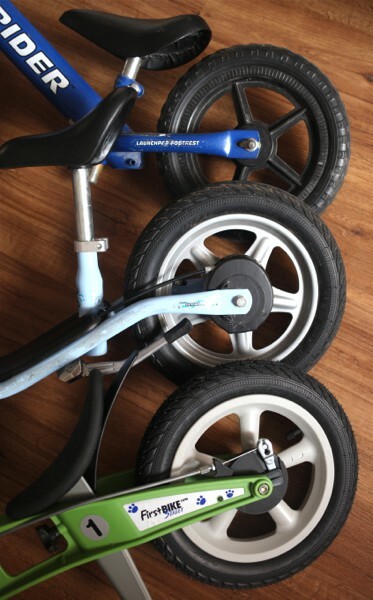 It has soft tires that will roll easily and resist punctures while your child learns to balance themselves on the bike. With an average rating of 4.6-stars and parents saying that it is the best thing they could have done for their child; you should be able to put this on your list of possible bikes. ​This wooden bike is designed with kids in mind. All bolts go into the wood so that they are flush against it and it works well for kids between the ages of 2 and 5 years old or until your child reaches 75 pounds. It comes in three color choices including, red, pink, and green. It is perfect for teaching children how to balance, steer, and stay coordinated while riding. As a bonus, since it is made of wood, Diggin plants a tree for every bike that is sold. It also weighs very little at 9.9 pounds and measures in with 12in wheels. However, some parents say that it is more for a child that is very tall or near age 4 and for that, you do need to measure your child and the bike to ensure your child can ride on it safely and comfortably. Skuut wooden balance bike for children 2-5. Kids kick off the ground as if running, pushing or skuuting themselves and the bike forward. Perfect for learning balance, steering, coordination and independence. Winner of The Oppenheim Gold Seal, Creative Top Toy of the Year and numerous other awards. Diggin plants a tree for every Skuut sold! Comes in red, blue and green. Maximum weight 75 lbs. ​The KaZam balance bike has a 12-inch steel frame and a built-in foot rest for children who are confident enough in their balance to use it. It has a maximum weight limit of 75 pounds. It has an adjustable seat and handlebars to ensure a proper fit for your adventurous child. It is available in a variety of colors for all children, whether they are male or female. The tires are air-inflated. It weighs in at 13.4 pounds, which is heavier than some bikes, but it also means it is capable of carrying larger children who still may not be ready for a traditional bike. The suggested age range is from 2-5 years, but many parents say that it is too big for their younger child. However, this does not affect the overall rating of 4.3-stars. ​Since the entire purpose of a balance bike is to give toddlers and small children the ability to feel like a big kid by teaching them to ride a bike early; accessories are a must for many. Accessories may be helmets, knee pads, and things to make your child safe, but they can also be fun additions that will make your child feel like a bigger kid. Therefore, you can use traditional bicycle accessories in most cases. For instance, you may be able to put a small basket on the handlebars for your toddler to carry around a water bottle, their favorite stuffed animal, a toy car, or other treasures. You can put a horn on it, reflectors, a small doll carrier, streamers, and much more. Accessories can be any number of things as long as you feel that your child is ready for it and there is no way for it to make the balance bike unsafe. If you are unsure what accessories will be safe for your toddler’s bike, you can ask the company that manufacturers your bike to see if they have recommendations. In general, though, if it can fit on a small child’s bike, it can work on a balance bike without issues or a risk to their safety. ​When choosing a balance bike for your child, you are going to be the one who must feel confident you are purchasing the right one. However, there are a few things that you may want to take into consideration before you purchase a new bike for your toddler. ​The size of a balance bike should be important to every parent. The idea of a balance bike is to learn balance without causing fear. They must push it forward with their feet and legs and often they must brake with them as well. Therefore, you should measure your toddler with the bike or purchase a bike that is adjustable enough to fit them. When your child sits down on the seat, their entire foot should be able to reach the ground on both sides of the bike’s frame and their knees should be slightly bent. If they must touch the ground with their toes, it is too high up for them to ride without falling and they will not be able to push off, slow down, or learn the right way to stabilize themselves. If you are considering a bike for a toddler that is 18 months old, you may want to choose a bike that has 10” wheels. If your toddler is between 2-4 years old, a 12” wheel should be suitable for them and very few balance bikes have wheels that are larger than 12”. As they grow older, the wheel size will continue to increase and so will their abilities with a bicycle. The weight of a balance bike is also an important consideration. These bikes come in all sizes to accommodate a young child until they are ready for a real bicycle. This means that some of them will weigh more than others. A small toddler balance bike will be lighter than one that is designed for three-year-old toddlers and a balance bike that is designed for young children who are 4-5 years will be heavier still. If you have a bike that is too heavy for your child, you increase the risk that they will get hurt by it and lessen the chance that they will be able to ride it easily because there will be more mass to push around. A good rule of thumb is to stick to a bike that is no more than 30% of your child’s weight. ​There are some balance bikes that have steering wheels with a limiter on them to ensure that your child cannot turn sharply. This is a good idea for kids who are just learning how to ride. If you have a bicycle that does not limit the steering wheel movement, your child may be riding along and turn the wheel too sharply, which will cause them to flip the bike and risk injuring themselves. Until they have more control over their bicycle, it is always recommended that they only be allowed to turn the wheel a little ways. ​Many balance bikes do not have brakes on them. This means that your child must brake using their feet if they need to stop suddenly. This is fine for most toddlers until they start to push forward faster on their bicycle. If you do feel that your child is ready for brakes, you will have two options. Some balance bikes have brakes on the front and some are on the rear. Many parents and professionals say that there is no right choice for this. A child that can push off very quick may flip over the handlebars if they brake suddenly and the brakes on the front of the bike. On the rear of the bike, they may catch their fingers or loose clothing in the brakes. Therefore, it is important that you talk to your child about the brakes if you choose to have a balance bike that has them included or choose a bike that has adjustable brakes. The adjustable brakes can induce a slower stop and lessen the risk of issues. In all cases, if you do have brakes on the balance bike, you should encourage your child to practice using them rather than always stopping by putting their feet down. This way, you will be helping them to develop a good habit that will help them when it comes time to ride a regular two-wheeled bicycle. ​The way a balance bike is put together is also something you should look at closely. If you see a balance bike that has exposed nuts and bolts on it, you may want to look at a different bike. This is because exposed bolts can scratch your child when they are learning how to use their new bicycle. You may also want to choose a bike that is made with rust resistant materials, so that you can give it to another child in the future once your child has outgrown it. ​Many toddler balance bikes come with a warranty to ensure that you are totally satisfied with it. This could be very important for some families who want to purchase with confidence. You should check to see whether the bike you are interested in is covered or not. A warranty often comes with a higher price, but as long as it is still within your budget, it may be worth it to spend a little more to ensure your child will not be left without a bike to use because they allowed it to fall over one time. ​Is Your Child Ready for a Balance Bicycle? Although most balance bikes for toddlers are inexpensive, parents may still want to know whether the balance bike would make a good birthday gift for their child. The only true way to know for sure is to base your buying decision on your child. To not consider their needs and their abilities could mean that you end up buying them a gift that they are unable to use right away. However, this does not mean that you should give up on the idea of your toddler riding a balance bike. In some cases, you will need to buy it to see how ready they are for it. Even if your child doesn’t jump on and start speeding around the block, it doesn’t mean your child wasn’t ready. ​The truth is, many toddlers will not sit on a balance bike when they first get it. Toddlers like to have their feet on the ground. They trust in it and know that their feet is what makes them able to stay upright and off the ground. To achieve riding, they will first probably walk with the bike between their legs. Don’t worry if your child does this. It is natural and they will eventually work up to sitting on the saddle and then walking with it. As they feel more secure and confident, they will gradually build up more speed as their confidence grows. It is important that you let them set the pace and simply tell them that they are doing a great job and you are proud of them. You should know that it may take several months to go beyond walking with the bike between their legs. You shouldn’t worry. Your child is progressing normally. To work up the courage to gain speed and start coasting, many kids wait months or even a year or two to start trying to coast enough that they can lift their feet and ride for a bit. ​However, if you still want to know whether your child is ready or not, you should watch them. Do they show interest in other kid’s bicycles? Do they get excited by other kids riding past? Are they able to walk and run without tripping up on their own feet? If the answers are, “Yes”, then it is a safe bet that your child will be ready to slowly work their way up to riding a bike of their very own. The whole point of a balance bike is to help small children learn how much fun it can be to ride a bike so when they are big enough, they can transition easily. Therefore, if your toddler wants your help, you should be readily available with the right kind of helping hand. In doing so, you should avoid one major mistake that parents often make. Instead of holding on to the bike when helping your child gain their balance skills, you should hold on to your child’s shoulders or place a hand on their back. The reason for this is simple, if you think about it. If you are holding the bike upright, they will not learn to correct it when it starts to lean. They need to gain an understanding of how it feels when it starts to lean, so that they will also learn how to correct it. Over time, they will learn what position their body needs to be in to keep it upright, the same way that they did when first learning to stand on their own. ​Most importantly, show your child that you are there for them. Remember that learning to ride a bike is challenging and scary. It is not easy and chances are good, you fell a few times when learning to ride as a child yourself. Many of us attempted to ride and then got frustrated and left it alone for a while before trying again. Many of us used tricycles and training wheels and with each transition had to relearn how to ride. You are making it easier on your child by giving them the ability to learn balance first, but that does not mean it will be a quick process. Show your support and encourage them to keep trying. They will succeed and be riding fast before long and then they will start to pedal on their bigger kid bicycle. Copyright 2019 Best Kids Balance Bike Reviews.